This is a mesmerizing debut novel about a young boy named Moses. The waif is born to a deaf mute woman and they live in utter poverty, completely dependent upon scraps to survive. His mother’s only role in life is to toll the massive church bells in the church tower that provides them with a place to live. From his earliest memories, Moses is attuned to the sound, able to discern even the minutest of changes or nuances, and he is entranced by the melodius sounds. Everyone believes he is like his mother, deaf and mute. But when his true father, the priest of that church accidentally discovers Moses can hear and talk, his father attempts to deafen him out of fear the secret of his paternity will be discovered. When that failed, he threw Moses into the raging river. Moses is rescued by two wandering monks and ultimately is brought to a monastery to live. There, he encounters Ulrich who attempts to preserve Moses’ beautiful voice by castrating him. As a castrato, Moses encounters adversity wherever he goes – from the taunting of boys in the monastery, to the ballrooms of Vienna. When Moses falls in love with the beautiful Amalia, and she with him, their lives are embroiled in turmoil as others seek to tear them apart. 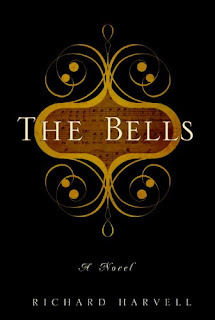 The Bells is a beautiful, tragic love story. The prose is redolent with music, as if the prose creates sounds and tones for the ear. Each page seems to evoke emotion as Moses faces one adversity after another, making the book literally unputdownable. I cannot say enough about the wonders and beauty of this novel and the emotions that grab you with every word. With all sincerity, this is one book you must read, not only for its uniqueness, but because it’s so very, very good!